You can thank Facebook for a lot of things, like knowing what your neighbor thinks about mall shoppers for example or those endless game requests. For once, however, you can thank Facebook for something awesome. About three years ago, Mercedes Benz asked their followers on their Facebook page for Golf Cart ideas, which led to the president of golf cart manufacturer, Garia, making her own pitch. Fast forward to 2016, and the luxury collaboration was revealed. Is it worth it, however? 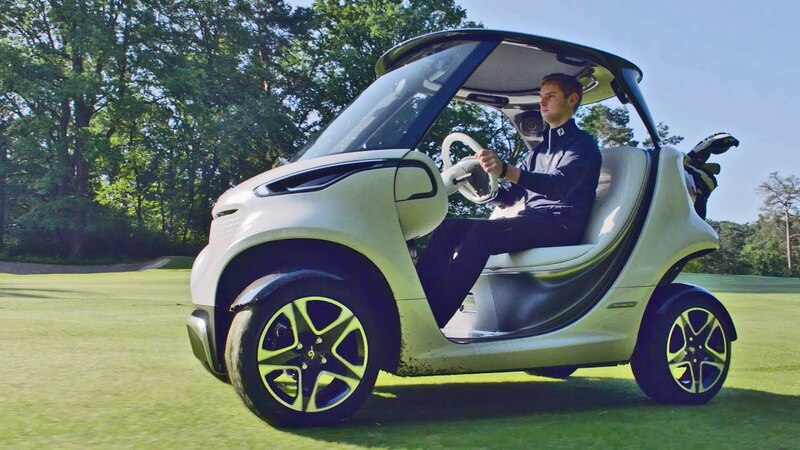 What could a luxury golf cart even offer you at this point? Status? Bragging rights? If you haven’t considered a Mercedes golf cart because you’re afraid that it’s all style and no substance, it might be time to reconsider. We’ve put together a list of five reasons the Mercedes model should be your next golf cart. Let’s see if we can change your mind. Mercedes wanted to make a golf cart of the future. The company wanted to take all the annoying parts of golf and use the cart to solve them. If you invest in the Mercedes cart, you get a fully tech-enabled experience before, during, and after the game. The most noticeable tech is the 10.1 touchscreen display. It allows you to select different driving modes (sport and eco), control the audio, and display various aspects of the game. You can get rid of your annoying paper scorecards, too. It allows you to keep score directly on the display, and leave those annoying bits of paper and half pencils behind. It also controls other aspects of the ride including the windscreen heater, wipers, and the refrigerator. It gives you fuel consumption and parking brake status. You can access weather apps and other internet activities. You don’t want to annoy others on the course by blasting music during the games, but before and after the game, you might want to bring the celebration. It’s equipped with Bluetooth speakers and wifi. Its integrated high-fi speakers put out an excellent sound that you can stream through your Bluetooth compatible advice. The music is well balanced, and the speakers produce a superb volume output. Do your fellow players a favor, however, and don’t test it out until the game is over. The old comparison for electric cars is that they’re little more than golf carts. The electric car world, notably Tesla, has done a lot to change that perception. Mercedes wanted to do the same for the reputation of golf carts and has done a pretty good job. Mercedes chose electric for its clean burning run and its lack of noise. Electric is nearly silent and has no emissions. It runs on a lithium-ion battery that takes about six hours to charge, and it gives you roughly 50 miles on a single charge. It reaches a top speed of 19 miles per hour and delivers an average of three kilowatts with 11 kilowatts for short bursts. It even includes a front grill with an air intake just like many sports cars. It weighs only 970 pounds, so it provides a pretty good kick for an electric motor. Speaking of kick, the Mercedes Benz is street legal in certain situations for the United States and parts of the EU. It has front disc brakes, and turn signals. There are brake lights, a rearview mirror, and the rims are a robust 14 inches. It even looks more like a car. 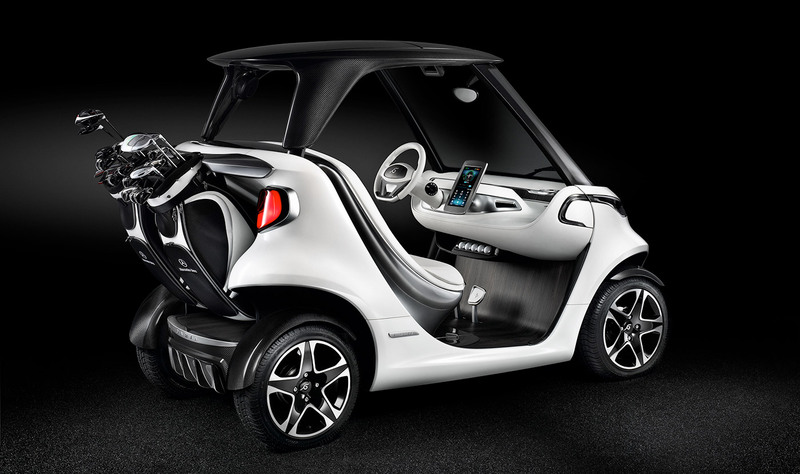 Though the open door structure makes its purpose clear, it has a more enclosed front and back cab piece, looking more like a Smart Car than a golf cart. There are even little details found in cars, such as a rear spoiler and a fully integrated roof panel, rather than the plastic roofs of standard golf carts. It doesn’t feel like a golf cart either. The company used carbon fiber to create most of the body panels and the roof. It has hand-stitched leather seats that are heated. The leather itself is soft and supple but completely waterproof. It has a heated windscreen to complement the heated leather seats should you find yourself playing in colder conditions. It has wooden details for an extra sense of luxury instead of the usual plastic trim. Under the dash, there’s a tray engineered to hold extra golf balls and tees. There’s even a hidden compartment that’s an integrated fridge with controls in the display. The headlights are surrounded by alloy, another high-end detail. Bottle holders are on both the passenger and driver’s side. There’s even a rear spoiler on the back that doubles as a highly efficient golf bag holder. It’s positioned at a 45-degree angle so you can look through your bag and find a club without taking it out. It feels well balanced and more like a small vehicle than a golf cart. Mercedes intended to elevate the golf cart by giving it all the types of features you’d find in one of their luxury sedans. A luxury golf cart isn’t a minor expense, but consider how much time you spend on the course. Do you rent a cart each time? Do you borrow one from a friend? If you spend a great deal of time golfing or use golfing for networking purposes, a well-designed golf cart can more than make up its expense. If you’ve decided that this is a worthy expense, you might still have a few questions. Let’s see if we can answer a few of them. The prototype was introduced back in 2016, and the design hasn’t changed since then. Garia began preorders at the beginning of 2018, and you can decide to invest in yours by filling out the application on their website. They are taking orders right now, but we don’t have any indication for how long. It’s not cheap. You can reserve your own with $1000 down, and the cart is a luxury $73,000. The deposit counts towards the total of the cost. The remainder is due before you can have the cart shipped. Neither Garia nor Mercedes offers any payment plan. All the features we listed above are included in every single style. All the technology, luxury materials, and highlights are available in every single model. You can choose between three exterior colors. White is a white body with a black roof. There’s also a black carbon version and a gray version. What logo is on the cart? The Garia logo is the most prominent logo. You aren’t going to get the classic Mercedes logo on the front. Instead, the Garia logo is on the front of the vehicle along with the steering wheel, bumper, and seat. You do get the Mercedes logo on the side of the vehicle as well as the touchscreen and the dashboard. The logos are tasteful. Though it’s clear who manufactured and who designed the cart, it doesn’t scream the logos across the entire body of the vehicle. If you’re into that, you might be able to custom make something of your own, but for the rest of us, it’s a beautiful, understated logo design. Why should I invest in one now? It’s currently only slated for a limited release. 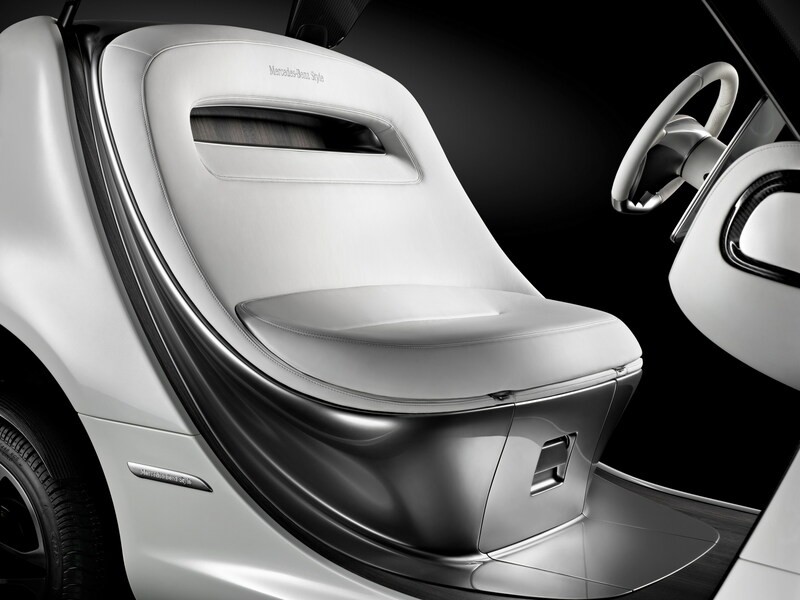 Although Garia makes plenty of luxury carts, their collaboration with Mercedes is for a limited time. There is no indication that once this release sells out that there will be a reopening of orders. It’s taken them two years from the prototype and even more from the Facebook pitch to put it on the market finally. If you want one, we wouldn’t risk waiting. The Mercedes Benz golf cart isn’t for everyone, but for a golf aficionado, it’s a worthy investment. It’s a well-designed and well-made golf cart that eliminates many of the inconveniences of traditional golf carts and golfing itself and replaces them with some innovative ideas. The Facebook thread couldn’t have dreamed at the time that their suggestions might come true. It’s less of a golf cart, and more of a vehicle meant for a true gentleman’s sport. What do you think of the cart? Does it live up to expectations? Would you consider investing in one? Let us know in the comments below.